CHICAGO--(BUSINESS WIRE)-- Hyatt Place Celaya opens today, marking the fifth Hyatt Place hotel to open in Mexico. The brand’s global growth throughout Mexico and Latin America illustrates the success of the select service model as Hyatt Place hotels continue to create value for guests and owners. Hyatt Place Celaya is owned by a joint venture between affiliates of Hyatt and Grupo Hermosillo. Other joint ventures formed by affiliates of Hyatt and Grupo Hermosillo also own Hyatt Place Los Cabos and Hyatt Place Tijuana. Celaya is three hours from Mexico City and is a city known as the Golden Gate of El Bajio. Recognized as a cultural and colonial destination that offers exceptional local cuisine and the best historical attractions to discover, Celaya offers plenty to explore, including parks, temples, museums, monuments, and vibrant Spanish architecture. 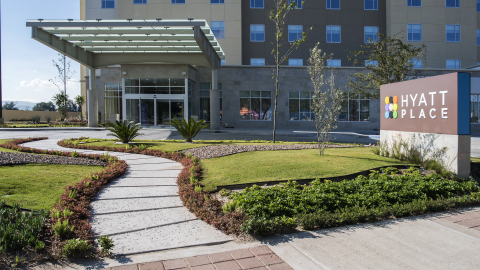 Hyatt Place Celaya is located opposite Galerías Celaya, the largest shopping center in the region, on La Cano Avenue and near all major roads to facilitate the activities of all visitors. Additionally, with a large concentration of Japanese companies in the area, the hotel has integrated Japanese speciality cuisine into its breakfast and 24-hour menu offerings. “Celaya is a vibrant city that’s continuously growing with diverse cultural, business and tourism opportunities, making it an important destination for the state of Guanajuato and its Pueblos Mágicos,” added Julio. For more information about Hyatt Place hotels, please visit www.hyattplace.com. Hyatt Place, a brand of Hyatt Hotels Corporation, combines style, innovation and 24/7 convenience to create a seamless stay with modern comforts. There are more than 255 Hyatt Place locations in the United States, Armenia, Chile, China, Costa Rica, Honduras, India, Mexico, Morocco, Nicaragua, Panama, Puerto Rico, Thailand, The Netherlands, United Arab Emirates, and United Kingdom. Join the conversation on Facebook and Instagram, and tag photos with #HyattPlace, #WhySettle, #HyattPlaceCelaya, and #HyattPlaceConEstilo. Hyatt Hotels Corporation (NYSE: H), headquartered in Chicago, is a leading global hospitality company with a portfolio of 12 premier brands and 667 properties in 54 countries, as of June 30, 2016. The Company's purpose to care for people so they can be their best informs its business decisions and growth strategy and is intended to create value for shareholders, build relationships with guests and attract the best colleagues in the industry. The Company's subsidiaries develop, own, operate, manage, franchise, license or provide services to hotels, resorts, branded residences and vacation ownership properties, including under the Park Hyatt®, Grand Hyatt®, Hyatt Regency®, Hyatt®, Andaz®, Hyatt Centric™, The Unbound Collection by Hyatt™, Hyatt Place®, Hyatt House®, Hyatt Ziva™, Hyatt Zilara™ and Hyatt Residence Club® brand names and have locations on six continents. For more information, please visit www.hyatt.com.